We host interactive and fun day camps during school holidays, spring break and summer. 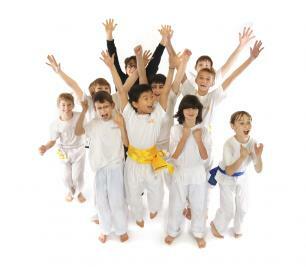 Activities include martial arts training and games, arts and crafts, field trips, swimming and more. Camps are for kids 5-up of all skill levels and abilities — including newcomers. Our annual "Camp Courage" at Tilden Park is five days of fun and fellowship and brings kids together from our schools nationwide! 2019 Overnight Camp at Tilden Park, Berkeley: 6/24 week. Also available as day camp 9-6 pm. 2019 Day Camp at Studio Naga: July 8-12..
GRLQUAKE WEEKEND EMPOWERMENT CAMP: May 3-5 2019. This weekend camp provides girls and young women with life changing self-defense and empowerment skills and space to make "fierce" and positive friendships! Strong age-appropriate self-defense skills will be taught along with art projects, journaling and peer group discussions stressing positive role modeling, appropriate boundaries, and how to make and be a good friend. Campers sleep at home the first night and return the next day for self-defense training and team building. After a group-made dinner, we’ll 'night hike' to further our personal journey towards compassion and confidence. May 3rd Friday Evening 6:30-9pm, Saturday 9am through overnight to Sunday, May 5th 10 am. Meals provided: Saturday lunch and dinner and Sunday breakfast. Register here. If you are a returning camper or student, you may pay at the Naga Store here.